It’s a celebration! 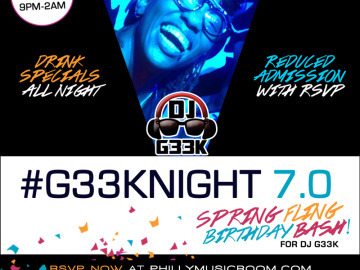 #G33kNight, Philly Music Room’s signature high-energy, interactive nightlife event returns for its 7th installment! Join us for a very special Spring Fling Birthday Bash for DJ G33k! AS ALWAYS, enjoy $6 Flavored Long Islands all night, PLUS $7 Reduced Admission when you RSVP (LIMITED QUANTITY). This fun night is not to be missed! RSVP like yesterday!